The new law, passed by the overwhelming demand of the American people, broke new ground in drug policy. 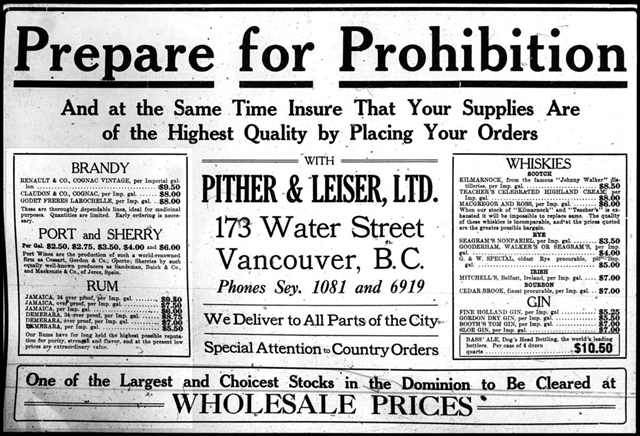 Finally forcing the federal government to regulate a drug which had been a part of American society since the Colonial days, the new policy provided an innovative compromise: adult Americans were permitted to possess the drug for medical purposes in the privacy of their own homes, but it was a crime to sell the drug or to manufacture it for sale. The law was in fact very similar to Initiative 71, which voters in Washington, D.C. passed by an overwhelming majority in the 2014 elections and news outlets were quick to label a victory for cannabis legalization. It also contains definite shades of a California-style medical marijuana bill, in which possession of the herb technically remains a crime but patients with a valid medical recommendation have been exempted from penalties. But history calls this law by a very different name: Prohibition. It is a mind-boggling measure of just how far this nation has gone down the path of drug policy insanity that the 1919 Volstead Act, which criminalized the sale of alcohol in every state of the US and which history calls “Prohibition,” had essentially the same rules for alcohol that D.C.’s “legalization” initiative lays out for cannabis nearly a century later. The Volstead Act, contrary to popular belief, didn’t really criminalize adult possession of alcohol for personal consumption; although the practice was nominally prohibited, the text of the law contained so many loopholes that practically any adult could legally possess and consume booze. The two largest loopholes during alcohol prohibition should in fact sound very familiar to any cannabis activist today: both “medical” and sacramental use were excepted. Thus, in the unlikely event that an adult couldn’t find a physician willing to prescribe him medical whiskey, he could always simply “convert” to Catholicism and keep his altar stocked for his weekly communion with holy spirits. Sure, it’s far from a perfect policy, as practically everyone knows; but what the Volstead Act did for alcohol during the Prohibition era would be hailed as a landmark reform victory if applied to cannabis today. It would even address some legitimate concerns; with the highly-visible presence of some unscrupulous profiteers preying on vulnerable parents curious about medical cannabis, a ban on for-profit sales similar to provisions in the Volstead Act might be a rational — if overly blunt — policy tool. Here, too, the path forward can be found through history, as over time Americans realized that legalizing and regulating alcohol sales (including restrictions on advertising to minors) were more effective strategies than criminal bans. Indeed, D.C.’s innovative “non-commercialized” cannabis legalization policy continues the nation’s history of evolving drug policy; with time and experience in the laboratories of states, Americans may deem the model superior to commercialized options. Only time will tell. Prohibition gets a bad rap these days, but it was a whole lot better than the drug war is today. It’s time the federal government chose the lesser evil.